Palm trees swaying in the breeze, waves crashing on the beach, the sun warm on your skin…. there’s nothing quite like a tropical vacation! 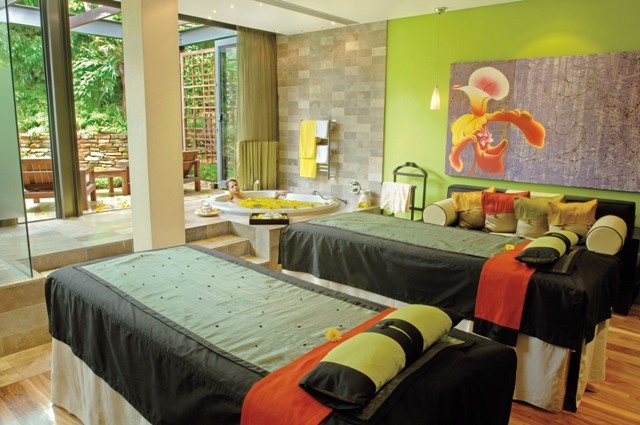 Why not recreate the feel of the island life and give your spa-goers a mini-vacation each time they visit? Get the look with tropical-paradise-inspired artwork. The Glow series is reminiscent of sunlight filtered through lush banana leaves. The Udon woven wood guest chair has a beautiful Wenge wood finish. It’s also a commercial grade furniture piece made to stand the test of time. Show off your favorite spa products for your guests to bring home with stacking display tables. Coconut sugar scrub anyone? 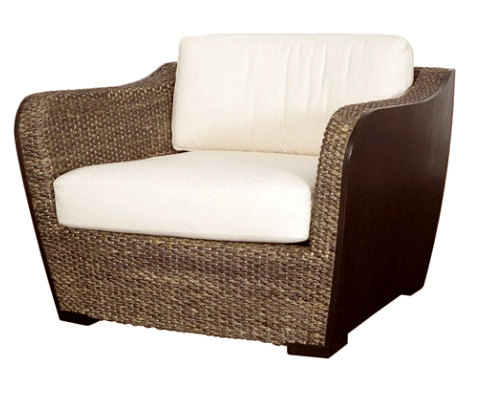 Bring the feeling of a luxury resort anywhere in the world with seating made of natural materials like rattan and deep-hued woods. Make cleaning easy with removable, washable cotton seat covers. Stone flooring is synonymous with tropical locales, so get the feeling of cool tile under your feet with durable porcelain. You don’t have to worry about staining or cracking, and full color body porcelain makes accidental scratches and chips barely noticeable. 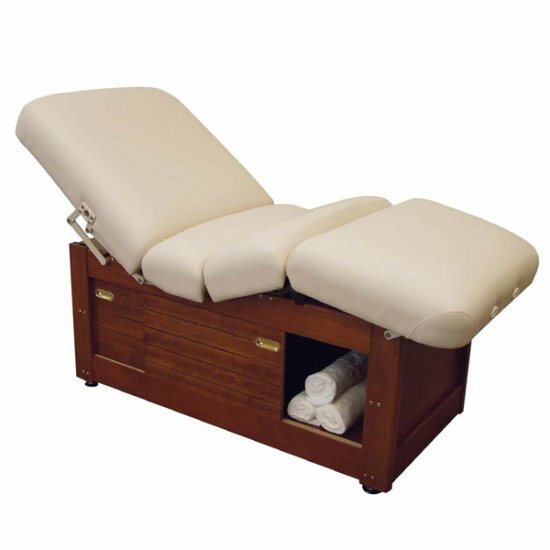 Make your clients and therapists happy with this multifunction spa table. It’s not just pretty to look at! This table is a fully functional workhorse with super quiet hydraulic lifting, space for a hot towel cabinet, built-in electrical, and an electric flex top. Carry your spa’s theme into your treatment room with soft spa linens. Be creative with your spa tables – add a tray with a fresh flower and an artful arrangement of tea, a bamboo mat with rolled towels, or a beautiful fabric saddle in an accent fabric. Anything to make your clients feel welcome and comforted! 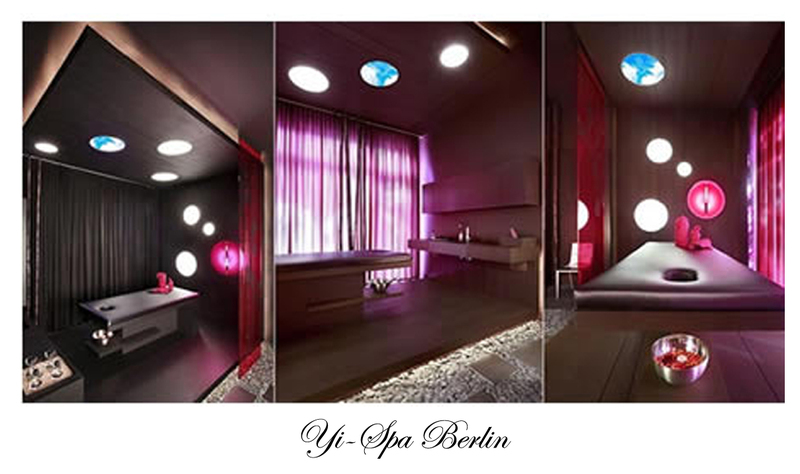 Breathtaking style will transform your spa interior into a soothing and tranquil environment. Sky blues, cool grays, lavender accents, creamy whites. An interior that fuses modern elements with zen details. Organic simplicity, water elements, stainless steel construction. Pure Spa—Pure Design—Engaging Decor. Captivating this tranquil space has all the elements for an relaxing spa. Fusing of fire and water elements against a soft warm color palette. You immediately feel at ease. The fusing of style is evident with the modern water feature and rustic wood floor. 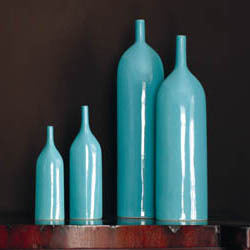 Add tranquil spa blue but with accents like these reed bottle vases. Perfect in a cluster to add interest and easily change up your interior style, even if just for the season! I am loving the spa interior movement that is putting out environments that cannot be defined by a particular style class. These environments are sophisticated, fashion-forward and timeless. Case and point: this Portuguese spa and haven, situated in a historical building in the heart of Lisbon’s old town is adorned with classic styles (Eames, Gehry) and vintage pieces while fusing modern touches with rich pallets. The flux from light and airy to exotic and almost primitive demonstrates typical Portuguese flair and fashion yet keeps us guessing. Modern Mix of Classic Style and Vintage Pieces. Eclectic Decor has rich pallets and vibrant color. 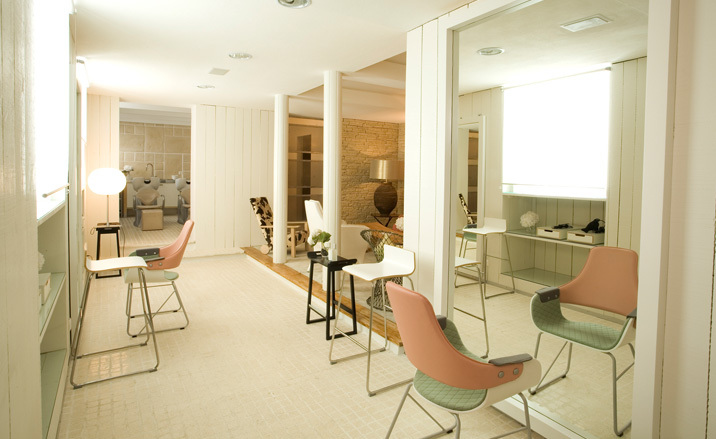 The salon is light and airy in direct contrast with the spa rooms. Color Trend: Spicy reds, browns, and pinks are the color of the season. Accent your spa with comforting details that romanticize your guests including a warm bath filled with fragrant colorful flowers, soft cushy slippers, aromatic candles and fresh blooms. Embellish your couples retreat with bamboo cotton linens and global fusion of exotic harmonies and ambient grooves. Finish it all with a touch of decadence: rose champaign and red velvet cupcakes. Rich warm browns tones create a candlelit glow around the room. Add new pamper me textures like plush linens, blankets, cozy slippers, or sheer draperies to further the mood. Great example of subtle use of seasonal colors with the fresh hot pink flower blooms floating in water, you can see it just melts your soul! 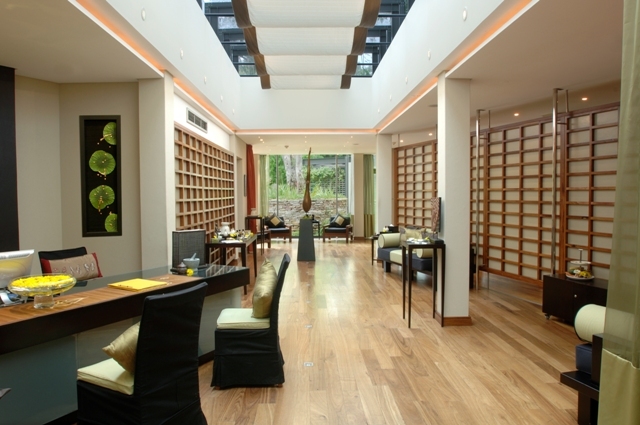 This spa interior has warm dramatic wood tones, a variety of textures, and what’s that- Yes, it’s Fucshia! Add a little sophisticated fun with small pops of this youthful color to differentiate your spa-goers experience. What an amazing place to travel for an out of this world experience! Adding artwork throughout your spa interior is a simple easy way to add interest and comfort to your space. Cluster artwork in groups for maximum effect. Don’t be afraid to pair photography with abstract art and various mediums of different shapes and sizes to create a unique and sophisticated focal point. A few examples of artwork in cool spa blues are featured below. Two long linear prints colored with the hues of twilight. Matted and framed with a 1 1/4″ Natural Espresso wood frame and non-glare glass. Abstract artwork matted and framed with a 2 1/4″ Espresso Wood Frame. The beauty of trees reflected over water are the subject of this piece. Matted and framed with a 1 5/8″ metallic silver frame. Preview and shop for more artwork at Spadecor.com! The snow is falling, it’s chilly outside, and the days are shorter – now is the time to create a winter retreat and get warm and cozy by the fireplace. Don’t have one? Don’t worry!! 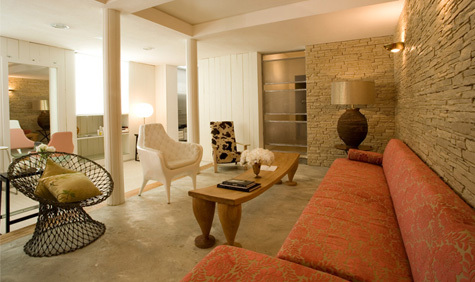 We have some great modern fireplaces that don’t require any gas lines OR firewood. You can place them anywhere in your spa interior to add the ambiance and warmth that only a real fireplace can provide. 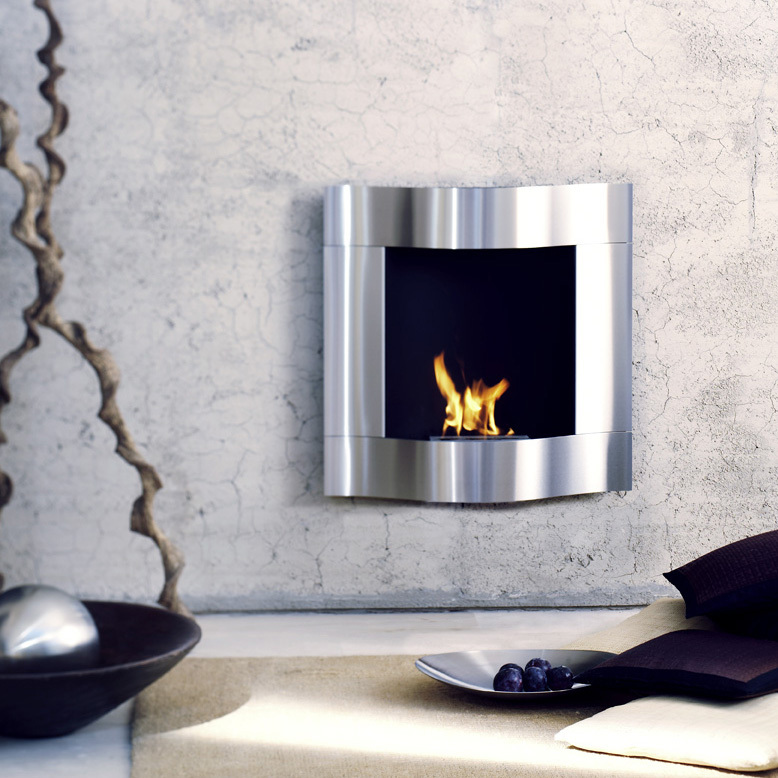 This modern stainless steel fireplace mounts directly to your wall, and doesn’t require a chimney! It also uses ethanol fuel, and the height of the flame can be adjusted. 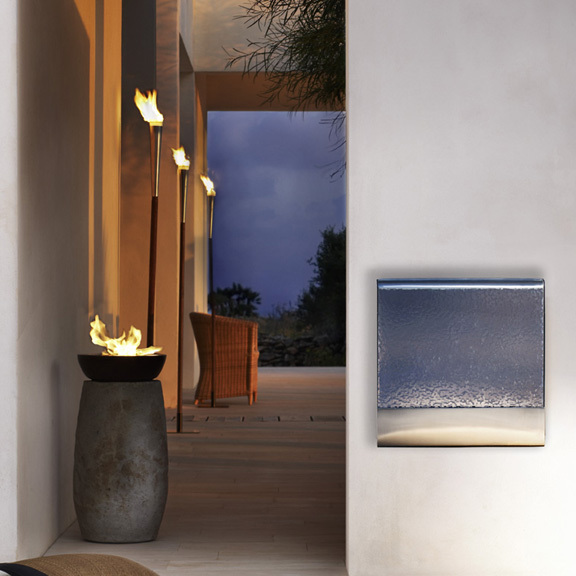 The Chimo fireplace is an easy alternative to adding a fireplace into your spa design. This impressive wall-mounted fireplace uses ethanol fuel, and requires no chimney making it easy to install anywhere in your spa interior. All our featured fireplaces are available in the Fire Elements category of our Luxury Upgrades at SpaDecor.com. Created by professional spa designers exclusively for spas, SpaDecor.com features unique spa furniture and accessories for today’s modern day spa, resort spa, destination, wellness, medical and fitness centers. SpaDecor.com offers a distinctive collection of art, spa lighting, finishes, spa furniture, and specialty items to fulfill every functional and esthetic detail for any spa design or style. The finest products from around the world have been resourced and identified to enhance the image, quality and experience of the spa interior. These items are now available exclusively at SpaDecor.com. We are a team of professional spa interior designers with experience creating successful spa interiors nationally and internationally. For years, we have personally resourced and identified the most effective items to enhance the image, quality and experience of today’s spa environment for effective spa design. We created SpaDecor.com to offer these exclusive items to you. We feature art, lighting, seating, spa furniture, finishes and specialty items to fulfill every functional and esthetic detail for your spa interior. Founder, Michele Pelafas, ASID, IIDA, has over 16 years of spa design experience and understands the exceptional needs of both form and function for any spa interior. An educator and an expert, Michele developed SpaDecor.com after years of success creating, specifying and sourcing from around the world the special details, spa furniture, finishes and accessories that make up the spa environment. These items are now available exclusively for you to experience at SpaDecor.com. 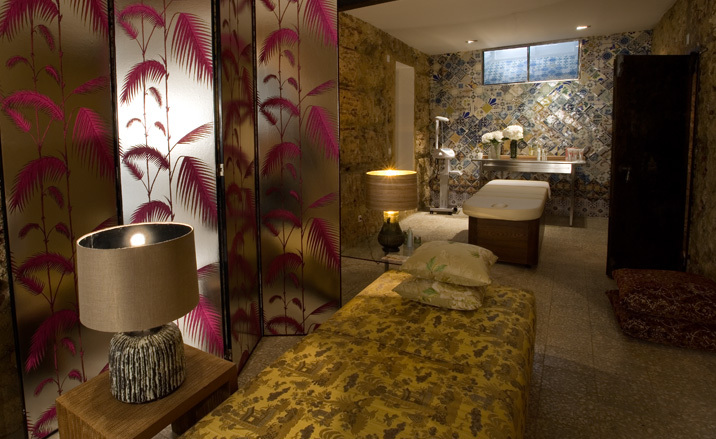 We look forward to sharing lots of great spa interior design tips. Look for topics on just about everything, like what is the best spa lighting to the best flooring, how to accessorize your room and many more great spa design ideas. We welcome you to join our subscriber list and welcome the new year!